Once a year, around the second week of June, my younger daughter revels in being an only child. Her older sister, an astronaut wannabe, heads to Space Camp in Huntsville, Alabama, where thousands of her peers engage in simulated missions and try out what it feels like to bounce around in zero gravity. She's sure she's the luckiest kid on earth. But my 13-year-old? She knows she's got it made. So often as parents we provide opportunities that aren’t valued until long after our children have left the nest. That’s why I was especially pleased to hear my teenaged daughter’s inspirational speech about voluntourism to her high school class. Not only was a volunteer vacation a life-changing experience for our family, here was proof that these lessons would play an important role in my daughter’s future. So you may have seen me walking around school in these crazy harem pants and laughed with your friends about them behind my back. Well if you saw me walking the streets of Delhi in these pants, you wouldn’t think I am crazy at all. Over the summer I had the opportunity to travel all over India and Nepal. Visiting these two countries was the biggest culture shock that I have ever experienced. Before getting off the plane, I thought that women only wore colorful, flowing saris at Epcot in Disney World. But actually they are really common among Indian women. The people in big cities like Delhi dress a little more westernized in tee shirts and jeans. For example, while visiting Kathmandu I discovered that the Nepalese people had an obsession with the iPhone app angry birds. You couldn’t walk down the block without seeing several people rocking the angry bird tee shirt, backpack, sunglasses—you get the picture. However, in the smaller villages angry birds was not as popular. My family and I went trekking in the Himalayan mountains near Pokhara where most of the women dressed in traditional saris, in fact our guide said that nobody in his family owned a computer or iphone, so he had no idea what angry birds was. Women in the small villages where we slept during our trek, cooked organic rice and Dal bhat over a fire place in the same way that their ancestors had for generations. And by “organic” I mean that they grew every single ingredient themselves. This was a type of living that I had only ever seen on the History Channel, and I didn’t realize people still lived like this. I’m so used to microwaveable ramen and dining hall food, that women squatting to cook over a fire from wood gathered in the forest looked prehistoric. At a school I visited, the children had no desks and even the high school students sat on the floor. Yet despite their lack of books and school supplies the kids were all incredibly smart. They actually loved going to school every day, which made me feel like a spoiled brat. I mean I can’t wait for long weekend. And the worst part was that when I visited a 2nd grade classroom, I was asked some simple mental math. The kids got it right away but I had to use my calculator. In all the small villages I visited, my braces always amazed the people. Although my Nepalese and Hindi were limited, and very few people we met could speak English well, I understood their confused looks as they pointed to my teeth. One lady gave me naan to see if I could still eat with the metal in my mouth! It was the same lady who I watched hold her newborn baby as it peed on the dirt floor. I suppose diapers aren’t very common in the villages because everyone just let their babies pee soak into the earth. Back in Kathmandu, a large city in Nepal, my dad flew in for a medical mission. He is an ear doctor, and hearing loss is a big problem in this developing country. He received a grant from the cochlear implant company, as well as from the company of another type of hearing aid called a Baja. I got to watch in the OR as my dad gave children the gift of hearing. He helped 4 children who would never have been able to afford this surgery without my dad. However, around 250 people come to this hospital that need this surgery every year yet only about 10 are able to actually afford it. It is very common for the Nepalese kids who do receive the surgery to have infections afterward because the operating rooms are so unsanitary. The doctors in Nepal give the kids far more antibiotics than they do in America to avoid infection. But I still thought it was kinda crazy for the head surgeon to sip a cup of tea, directly next to my dad while he was preforming the surgery. I suppose that is just a cultural thing, because people drink a lot of tea in Nepal and India. Watching a 2 year old boy hear for the first time in his life, and hearing his father thank mine for giving him a gift they could never afford, really touched me. My dad had done such a great thing to help this boy, even if it’s only one less deaf child out of the 250. It got me thinking about what I could do to help the people in Nepal. The reason that more people suffering hearing loss aren’t helped is that it is such and expensive luxury which neither the hospital nor the patients can afford. So I thought about ways to make it cheaper. What if the $11,000 drill only cost $250? 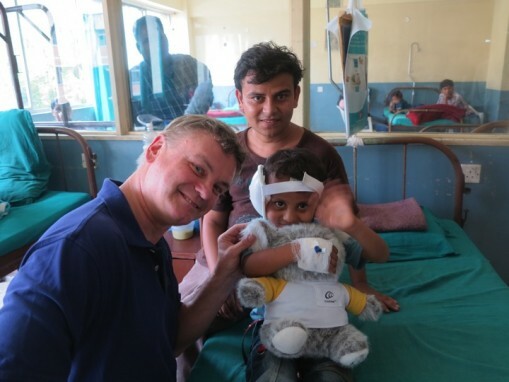 What if they sterilized implants from dead people to give to the deaf children in Nepal? I am currently working on projects to hopefully make both these dreams possible, but there are so many more things that I could do to help the people in India and Nepal. What if I started a diaper donation for the women in the small villages? What if people gave books and school supplies to the Indian mini-Einsteins? And what if an affordable method of ortho-denture were brought to the lady who gave me naan? By traveling and seeing a world so different than my own I was able to pick up many things that could be done to make it a little better. It is important to learn and experience cultural differences, because understanding the world you live in will help you to make it a better place. Emma Willard gives us all this unique opportunity to experience different cultures first hand. From celebrating Holly day with colorful powder, to enjoying FASO dinners, to just hanging out with a girl from another country. I hope everyone here, American or international, takes full advantage of these opportunities to learn about the world, and uses them to think of something they can do to make the world a little better. Sandra Foyt inspires lifelong-learners to change the world. A former education advocate and enrichment coach, she lived in Buenos Aires, Puerto Rico, the Virgin Islands, Washington, D.C., New York City, and Southern California before settling in Northeast NY with two teens, an outdoorsy husband, and a well-indulged Chocolate Lab. Sandra contributes to Being Latino, and her portfolio appears at www.SandraFoyt.com. Also, check out AlbanyKid. If you’re contemplating travel with teens you may be feeling a bit of dread mixed with that vacation-anticipation. “Making memories” can be fantastic, but the pressure to do it right, keep your teen engaged, and above all have fun can drain the pleasure out of any vacation. One of the best trips I’ve taken was a recent journey to Italy with my teen daughter, a senior in high school, to explore Pompeii for my upcoming historical novel, Pompeii: City on Fire. From Day 1 of trip planning, give your teen the reins in some area. My daughter’s excellent sense of direction always trumps my tendency to get lost, so she knew it would be up to her to navigate us through Rome and Venice. If there’s a particular location that interests your teen, give him the task of planning your time there. How about one day that is completely his to plan, from activities to food? He’ll have ownership of the adventure, and probably be more agreeable to the plans you’ve made as well. Our trip to Rome was primarily to research Pompeii for my upcoming novel, but my daughter really wanted to see Venice. It meant a side trip of a couple of days and some extra expense, but seeing something she was interested in made the trip more enjoyable for both of us. Because I had no agenda there, I found that the days in Venice were wonderful. Find out what is most interesting to your teen in the area where you’re traveling, and make sure you spend adequate time there to satisfy her curiosity. Nothing is worse than a teen complaining about too much walking or driving. If your destination is a city, decide before you arrive how you’ll get from place to place. Walking always feels longer than you expect. Public transportation provides local flavor and saves money, but takes more time -finding stations and waiting for arrivals. (Though my daughter and I have some laughable memories of Bus #64 in Rome!) Taxis save time and sore feet, but can be expensive. A mix of all three will keep everyone from getting too grouchy. If you’re headed for someplace educational and want to be sure your teen gets all the info, I highly recommend audio tours. There are a number of companies online that provide downloadable walking tours for worldwide destinations. My daughter and I loaded several of these onto our iPods, hit play at the same time, and walked the cities with our own personal tour guide. We learned history, but it also satisfied some of that inherent need teens have to be “plugged in”! Take your cue from the average teen’s attitude, and don’t get freaked out when things go wrong. Because things will go wrong! Be spontaneous and flexible and embrace the unexpected as an adventure. I can hardly count the episodes my daughter and I encountered – a missed bus at the top of Mt. Vesuvius, a surprise roadside downpour, late night searches for wi-fi – but every one of them is now an entertaining story we brought back. Don’t let detours ruin the fun. Are you continually amazed at the amount of time your teen can spend asleep on the weekends? Don’t forget that they still need extra downtime when you’re traveling, too. Be sensitive to their need for a little space and some extra rest. If the crankiness starts to build, it’s time to take a break. Don’t forget to get pictures with your teen. It’s easy to forget while you’re sightseeing. You return home to find hundreds of shots of the sights, pictures of your teen,maybe a few of yourself. But make sure you find other friendly tourists and get some photos of both of you in all the important spots. It may feel awkward to ask a stranger, but you’ll be glad you did. Those pictures together, taken at such memorable times, are priceless. Once you’ve returned, don’t let those photos disappear into digital storage! When my daughter and I returned from Italy, I used an online service to put together the best of ours into a photo book, an 8 inch-by-8 inch hardback book with a montage of photos of the two of us on the cover. Include some anecdotes and fun captions. And remember, before you know it your teenwill be headed off to college or life outside your home. It’s easy to order two copies, one to send along into life with your teen. Someday maybe your grandchildren will love looking through it! I’ve traveled the world researching my historical novels, but the trip to Italy to research Pompeii was unlike any of my others because my traveling partner was 17 years old. It was an adventure for both of us, and a shared memory that we carry into the future. Don’t let concerns over attitudes dampen your enthusiasm. With a bit of forethought, travel with teens can be great! Historical fiction author T.L. Higley doesn’t just transport readers to the settings of her books, she transports herself as well. Her trips to Greece, Egypt, Jordan and Italy have found their way into her suspense novels, including the popular Seven Wonders series. Her upcoming Pompeii: City on Fire brings to life the lost Roman city buried by a massive volcano. The birth of empathy between siblings is a beautiful thing to witness. One of the many unexpected joys of living abroad is watching the way such a powerful experience changes your children. For the better. Kids who travel together, learn to rely on each other in a deeper way than life in suburban America demands.